I’ve been trying to wrap my head around relativity again – the special and general kinds – and it got my thinking about how we rely on and live with absoluteness. How everything in our lives is 6 feet tall, 3 hours long, smart, funny, etc. instead of being 4 times the length of a cat’s tail, half the weight of a wooden chest, smarter than your parents and funnier than your neighbor. We created a world of absolutes that holds us as the ultimate frame of reference and we are so used to it, that we tend to forget about the fact that there is no such thing as one meter, one second or one kilogram. Yet when we get down to analyzing the deeper secrets of this universe, we need to let go of our system of 100% certainties and absolute measurements. Einstein’s Theory of Relativity shows that time and space – concepts we tie our frames of reference on – are not as stable as we think. Measurements of duration and distance are relative values with respect to motion and gravity. And it all comes down to this very strange behavior of light, of moving always at the same speed regardless of the motion of the light source or the frame of reference of the observer. This is the mighty obstacle that seems to make it impossible to ever pin down an absolute frame of reference. If this weren’t the case, if light would just behave as you naively assume it should – going faster or slower depending on the observer’s own velocity – then Einstein would have been able to catch up to the ray of light in his thought experiment and math would allow us to refer the absolute reference frame by comparison. Motion can only be measured in relation to a reference point. Yet no absolute reference point exists that in time and space. Reference points are created by the act of observation. A cycle of observers – each observee and observer of the next in line – can create a loop of dependencies that exists without the need for absolute measurements. 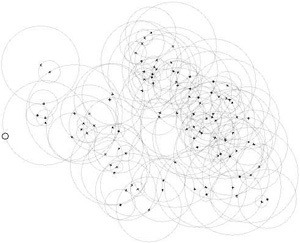 The shape of the Milky Way Galaxy as deducted by William Herschel in 1785, based on star counts. The universe and the organization of matter within creates a series of reference points controlled by the gravitational attraction of heavy objects. Our immediate frame of reference is the soil beneath us our feet which happens to rotate around the center of our planet, the earth itself orbits around the sun and the solar system rotates around the Galactic Center (center of the Milky Way Galaxy). By adding up these velocities we end up moving through space at an incredible speed, yet we are not able to perceive it as such. Our sensory system only gives us information about acceleration and ignores steady motion. No matter if being on a moving train or on a planet rotating around the sun at a speed of 30.000 m/s, we can’t distinguish between these situations and a possible state of immobility. Change is relative, whereas stability only has value in relation to an absolute frame of reference. Our perceptive system is always on the lookout for change and seems to favor it over constancy and stability. Change marks the possiblity of danger and therefore requires focused attention. If we are confronted with monotonous visual inputs our brain loses interest and turns off. If we are confronted with a steady sound, our brain learns to filter it out. That’s why we don’t see the veins of blood vessels positioned directly in front of our eyes, or feel the weight of the air on our skin. It is our way of dealing with an overload of information, by filtering away any redundancy and keeping our attention focused on what’s important: alteration / transformation / modification / variation – change. 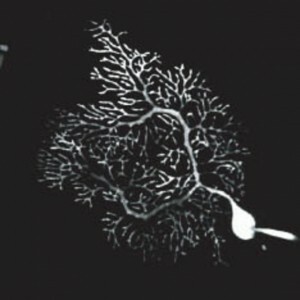 The Purkinje Tree is the image of the retinal blood vessels in front of our eyes and what we would continuously see superimposed on our image of the world, if our brain would deduct it as redundant information. Where’s the Center of the Universe? We know the sun is the center of our solar system, and we approximately know the location of the center of our galaxy (supposedly a massive black hole). And we even have an idea of the center of the Local Group of galaxies we move along with. So, going one step higher should lead us to the center of the universe, right? The exact location of the Big Bang, the spot of explosion that catapulted matter into the eternal outwards drift? Easy? Not easy. Not possible actually. We can’t pin down the center of the universe, because the Big Bang was not an explosion in space, but an explosion of space. Instead of matter hurtling outwards from a central point, space itself is expanding. And it expands uniformly (Hubble’s law) – the farther away galaxies are, the faster they recede from the location of the observer. This could make you believe to be at the exact center of the expansion point. Yet the same behavior can be observed on said far far away galaxies and is true for every point in the universe. 1 meter … Originally intended to be one ten-millionth of the distance from the Earth’s equator to the North Pole. Since 1983, it is defined as the length of the path traveled by light in vacuum in 1⁄299,792,458 of a second. 1 second … Early definitions of the second were based on the apparent motion of the sun around the earth, so the second was 1⁄86 400 of the mean solar day. Yet this average time is lengthening and therefore no suitable basis for definition. Since 1967, the second has been defined to be the duration of 9,192,631,770 periods of the radiation corresponding to the transition between the two hyperfine levels of the ground state of the cesium 133 atom. 1 kilogram … is almost exactly equal to the mass of one liter of water. The kilogram is the only SI unit that is still defined by an artifact, whereas all other SI units have been redefined using a fundamental physical property that can be reproduced in adequately equipped laboratories. 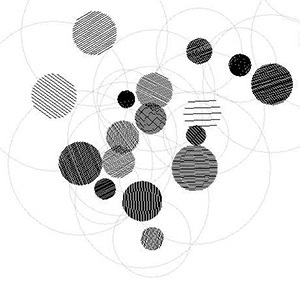 Posted in Research and tagged 2011, change, frame of reference, motion, observer, processingjs, relativity, space, speed of light, time, universe.